Imagine The Mosquito Coast if Harrison Ford's character was a nice guy and you've got an idea of the kind of movie Captain Fantastic is. A fable centering around a loving patriarch who's opted to move his family away from society in the hopes of giving them a different kind of value system, Captain Fantastic is a hippie fantasy come to life, and a charming one at that. Mortensen's iconoclast patriarch teaches his kids to be self-sufficient in nature, as well as fully educated on history, politics, languages, sciences and more, having educated them all to the point that his eight-year-old daughter can recite the declaration of independence by memory while his oldest son has been accepted to Yale, Brown, Harvard, M.I.T. and more. All of the kids possess genius level IQs and a distaste for what they've been taught is a fascist system of power. To give you an idea, instead of Christmas, their big holiday is Noam Chomsky day. Director-writer Matt Ross deserves a lot of credit. His follow-up to the low-budget Sundance hit 28 Hotel Rooms, Captain Fantastic could well have been an insufferable Hollywood fantasy. While Mortensen's patriarch is often too good to be true, as are the kids, to Ross's credit he's canny enough to give the film multiple perspectives. One of the kids convincingly bristles throughout at their lack of social interaction (they're so sheltered none of them know what Star Trek is) and the adversary, his late wife's conservative dad (Frank Langella) is portrayed in a three-dimensional way, even if we're clearly supposed to be on Mortensen's side throughout. 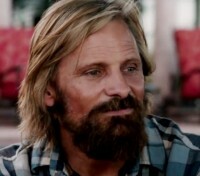 Viggo is ideally cast. He's always seemed like a man from another time, and it feels like a role only he could have played. Probably the reason for this is that he's just so sincere. Mortensen always seems like a man with good intentions, and his love for his children is never anything less than convincing. He also shows a bit of levity here for the first time in a while, with amusing scenes where he tries to give his eight-year-old the "birds and the bees" talk or fakes being a Christian home-schooler to avoid the cops. He's absolutely likable, even if for much of the film I thought the character was insane. George McKay, from How I Live Now and Pride, is also very good as Mortensen's oldest, his father's right-hand man who's torn between his need to be free and experience the world and loyalty to his dad. Perhaps the ultimate testament to how good he is is the fact that when his name showed up in the closing credits at the packed premiere screening at Sundance, the audience roared with approval. Ross has also given Captain Fantastic a really gorgeous look, with terrific location photography and a real ethereal vibe at times that makes this feel reminiscent of Into The Wild. It's certainly a big-hearted, often beautiful family film that really belongs on the big screen and will hopefully pick up the kind of distributor that can make that happen. It's not perfect (it could stand to lose a good ten minutes and the ending is too tidy) and often naive, but it's also very entertaining and one of the most purely enjoyable movies of the fest so far.